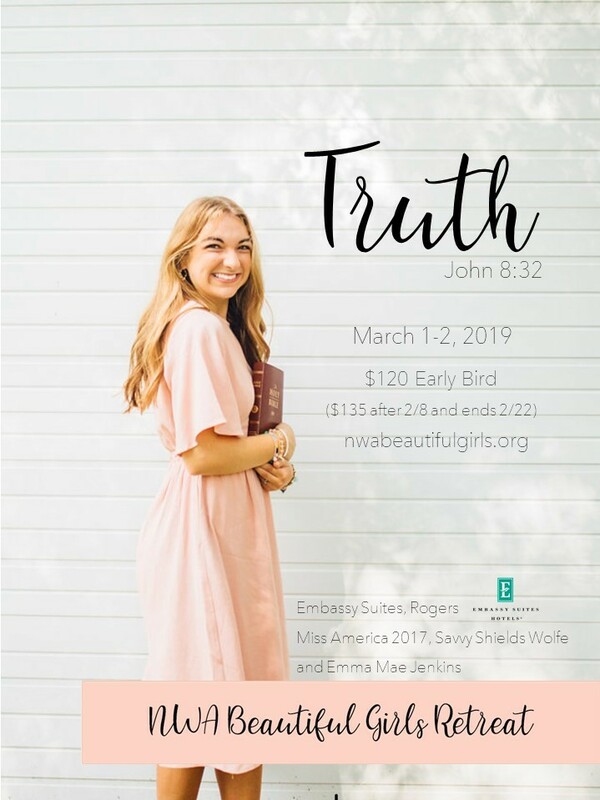 The 2019 Beautiful Girls Retreat will be held on March 1-2. For each participant (girl or adult), please complete this online form and the Medical Release form, and click the Submit button. Seating is limited and registration is first come, first served. Sign-in begins at 4:30 pm Friday, March 1. The $120/$135 price per person covers the cost of the hotel room (6 people per room), entry to all event activities, and catered meals. For private room options, please refer to the FAQs/Rooms. Chaperones must be 18 or older and go through Beautiful Girls Retreat training prior to the event. If you are interested in being a chaperone, please refer to the Chaperone Requirements section below. We are excited to have you join us in this community based, regional retreat. If you have questions, please check the FAQs or feel free to contact us at nwabeautifulgirlsretreat@gmail.com. Room requests (optional). Please list your church group, chaperone name, or desired roommate(s) attending. Each room accommodates 6 people including at least 1 chaperone. We must have the competed Medical Release form for each participant in order to hold your registration! Download the Medical Release form HERE, complete and return. Please indicate which return option you will use. Please ensure we have your completed Medical Release form by February 8. We are excited to offer a special, complimentary session for the brothers, husbands, dad and other men in our girl's lives. Please consider joining us for this hour-long session with Jim Zalenski, a local father and staff member at Rugged Faith Ministries. An accompanying devotion will be led by Clayton Bramel. If interested, please check the box below, provide contact information and we will send details. Yes - Please send me information regarding the Men's session. We are pre-ordering this year and you can get an early bird discount before February 8. To order your 2019 BGR T-shirt, please check the T-shirt Order box below and we will provide details soon. Yes - Please send me T-shirt pre-order information. The NWA Beautiful Girls Retreat 2019 Art Show will be part of the eleventh annual retreat. We will have the art displayed at the retreat, as well as a contest and prizes for categories winners! If you are interested in participating, please check the box below and we will send you details. Yes - Please send me art exhibit information. Would you consider becoming a sponsor? If so, please add to donation option below. For gift certificates and other information, please click Sponsor. For your convenience, you can use most major credit card through PayPal. We encourage you to complete your registration as seating is limited and will be first come, first served. Registration is not secured until payment is received. I am interested in getting more information about serving as a chaperone. ** Please note that registration is not complete until payment is received.